Marayoor (also Marayur) is about 45 kms from Munnar, on the north eastern corner of Idukki. It falls in the same rain shadow region as Chinnar Wildlife Sanctuary. Marayoor is known for its natural sandal wood forest, dolmens, cave writings and jaggery making units. This village is also a part of the tourism hub that include the orchards of of Kanthalloor and Chinnar Wildlife Sanctuary. You may need a couple of days to explore them all. It is possible to breeze it in a day tour, if Thoovanam waterfall tour and the wildlife treks are deleted from the sightseeing list. 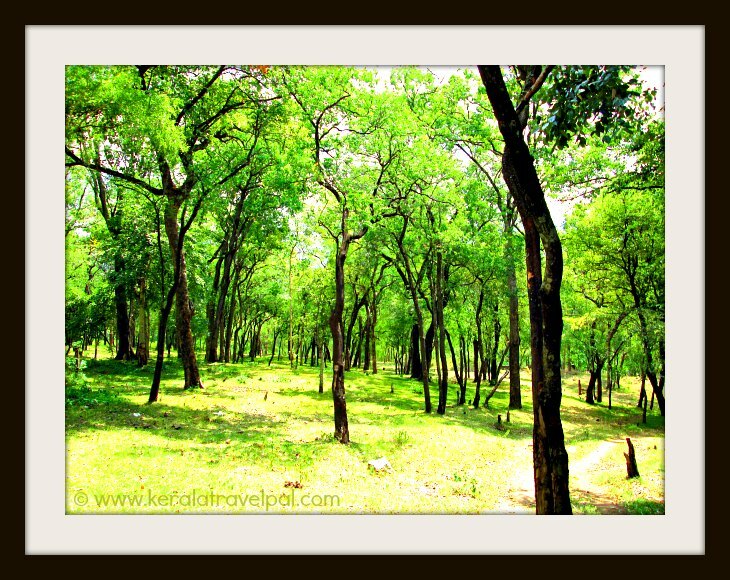 Marayur has the only natural sandal wood forest in Kerala. About 60,000 sandal trees are spread over 95 sq kms. Munnar to Marayoor travel is a scenic ride along tea gardens, waterfalls, shrub forests and plantations. The final part of it is through sandal wood forests, which starts before Marayur. Yes, you can travel through the sandal forest. However, you cannot touch the trees or smell them as the whole forest is fenced off. Sandal wood is expensive. So the government has fenced off the forest to protect it from unauthorised logging. If you are not happy about Marayur sandal forest tour being a fenced off experience, you can arrange a sandal forest walk with the permission of forest authorities. To avoid disappointments, contact them in advance. The inner wood of sandal tree is fragrant. Sandal oil is extracted from the wood and roots. Government runs a sandal oil extraction factory; however they do not allow visitors in. Sandal oil is an essential ingredient for many expensive perfumes. Sandal oil is a perfume by itself. The oil is available for purchase at handicraft emporiums in Kerala. Also available for purchase is small artefacts made out sandal wood which carry the distinct aroma. Dolmens are ancient burial chambers. They are thousands of years old. Some even date back to 10,000 years. While most Dolmens are of the Stone Age, there are some others belonging to the Iron Age. 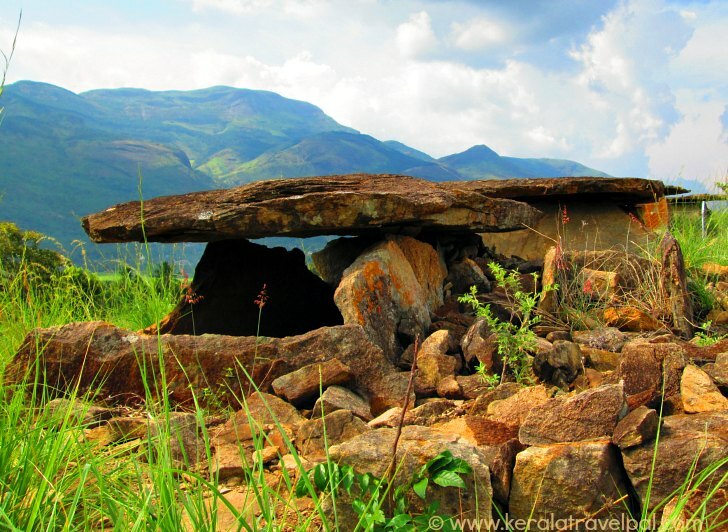 Dolmens are scattered in several locations in this part of the world, including the reserve forests of Chinnar. All Dolmens have a similar structure. A small chamber within the ground is walled by four flat stones which extend above the ground. A fifth stone is placed on top the four as a roof. Some Dolmens have more than a single burial chamber in them. One of the Dolmen sites is about one km from town, towards Kanthalloor. That location is not far from the Government School. Another site is Kovilkadavu, at the banks of river Pambar. It is close to Siva Temple (Thenkashinathan temple). Ezhuthupara (also Ezhuthu Guha) is a cave with ancient paintings on its walls. The cave is inside Koodakavu Sandalwood Reserve Forest. It is a pity that some of those paintings, thousands of years old, have been damaged by reckless visitors, even though Ezhuthupara is a protected site under the Archaeology Department. If you are interested in rock paintings of the region, there are more at Kovilkadavu. The paintings are near Pambar River, just about 5 kms from Marayoor town. Attala, at western Marayoor, is another ancient rock art site. The sugarcane fields of the region are hard to miss our attention. Marayur has about 1500 acres of them. Sugar cane harvesting is an interesting period at Marayur. Bulk of the sugar cane produced is locally used to make Jaggery. There are several small outfits involved in it. 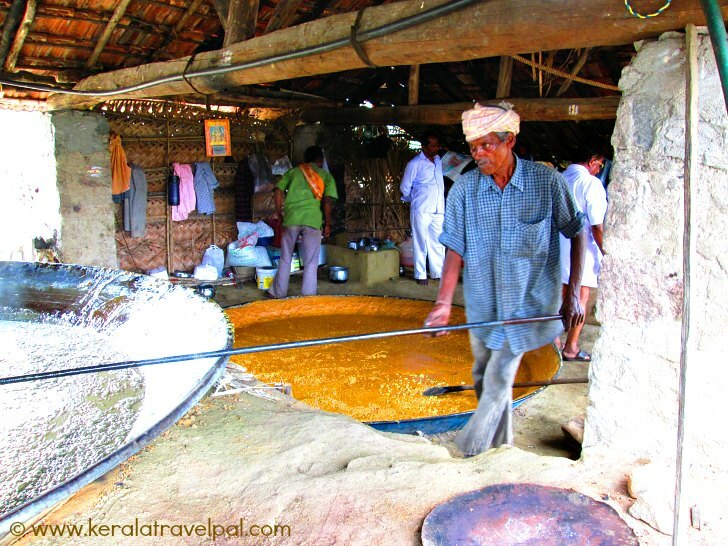 Jaggery making is a local small scale industry. You can visit one of these places and watch what they do. Jaggery is made by boiling sugarcane extract. The finished product is a dark brown sugar ball. The sugar content is as high as 97 percent. Marayoor jaggery is considered a quality product and hence in great demand. Many prominent temples use this jaggery to make sweet offerings. They are sold at local shops. As the name says, it is a venue for children. Adults also find it interesting as the whole park is designed under the canopy of a very large banyan tree. Kanthalloor is known for its pleasant climate, beautiful vistas and varied plantations. ....quite a list of fruit and veg to make the hill side green. However, lemon grass spreads green over the valleys the best. The aromatic herb is grown widely in the whole Marayur – Kanthalloor region. Lemon grass enhances flavour of food. Hence used in curries, food pastes, teas, soups and so on. Lemon grass oil is medicinal. Local outlets sell it. Nearest towns: Munnar at 42 kms. Bus Station: Munnar at 42 Kms. Taxi Hire: Munnar Town at 42 Kms. Railway Station: Eranakulam Railway Station at 150 kms, Aluva at 120 kms. Accommodation Options: Resorts, hotels and home stays in Marayoor. There are resorts and homestays in Kanthalloor or else you could stay at Munnar. Nearby Attractions: Chinnar Wildlide Sanctuary, Periyar Tiger Reserve, Kumali, Munnar, Devikulam, Peerumedu, Eravikulam National Park, Mattuppetty, the Arch dam, Idukki wildlife sanctuary, Anamudi, Eco Point, Top Station, Waterfalls of Cheeyappara, Valara, Thommankuthu, Keezharkuthu, Attukal and Chellarkovil, Carmalagiri elephant walk, Anachal, Malankara reservoir, Mangala Devi Temple, Meenuli, Kundala dam and Kalvari Mount.